The truth is, I really thought I was done buying the property, or former property, of Frieda Hughes. Turns out, I was wrong. 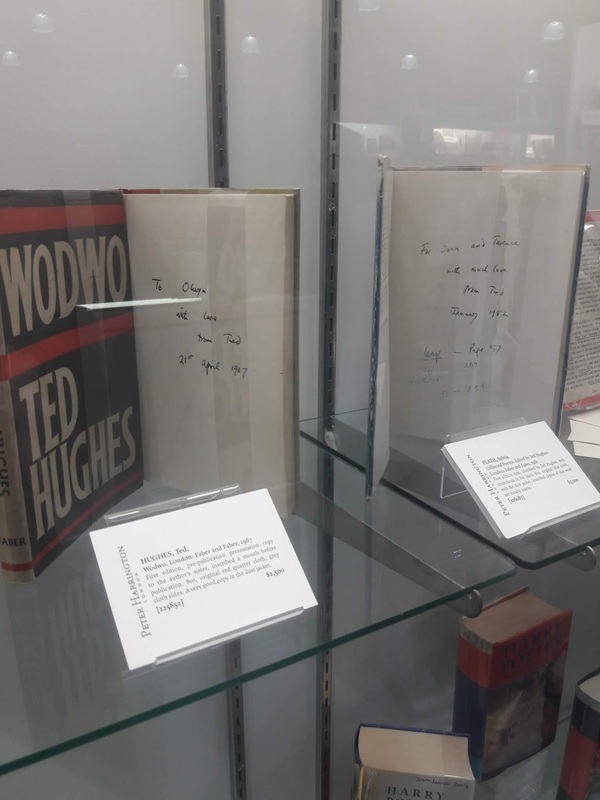 Back on 29 August 2018, there was an auction for seven boxes of books in translation by Sylvia Plath and Ted Hughes via Halls Fine Art in Shrewsbury, England. The winner of the lot was a gentleman in every sense of the word called Norman Macdonald. He started listing his new stock online via ABEbooks and included images of many of the books. 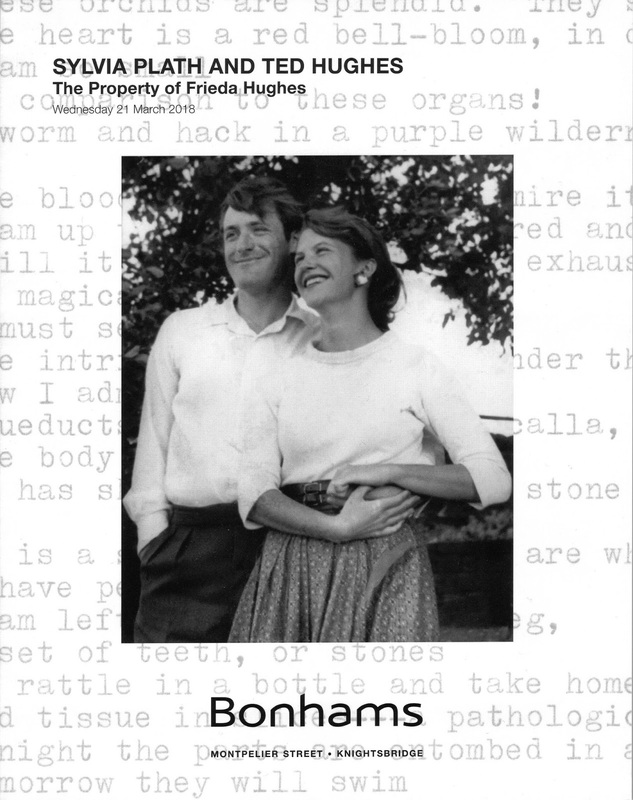 The provenance to these books is Ted Hughes to Frieda Hughes, and some of the books include letters from Faber passing on the copy/copies of the book(s). The Slovak translation included one of these aforementioned letters from Faber to Frieda Hughes. A couple of these were new to me and so are now on the Non-English book covers page over at A celebration, this is. And as well, some of the books now have better images, if they were already represented. These books join other translations: Norwegian, French, German, Hebrew, Hungarian, Italian, Swedish, Spanish, Catalan, Turkish, Japanese, Macedonian, Estonian, and Slovenian. And I have an edition in Braille, too. I highly recommend you all view Normal Macdonald's Collection of Sylvia Plath's and Ted Hughes' books and acquire something for yourself. Norman's pricing is fair and his customer service is professional and expedient. It is a unique opportunity to own something with a rich, significant, and unimpeachable provenance. 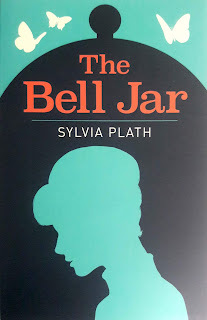 My parents gave me this Arcturus edition of The Bell Jar for Christmas, too. It us really lovely. All links accessed 19 November 2018. 2018!!! To quote Tori Amos, it was a "pretty good year"!! In fact it seems the last few years have been filled with Sylvia Plath! That is a good thing. This is, as usual, a blog post recapping the year of Sylvia Plath as it appeared in this blog and in my life and I hope that somehow there is a confluence with how you perceived Plath in yours. In December 2017, I found out about the big Bonhams auction but was asked to stay quiet on it. Which was difficult, but necessary. So to keep that at bay I decided to post right off the bat about the 43 newly located articles on Plath's first suicide attempt. I just can't stop looking for Sylvia Plath. In January I helped to proof the Bonhams sales catalogue, found out that Smith College was going to get the Ruth Beuscher letters, and started the first round of proofing of the second volume of Plath's letters. I guess you could say that the year started out on fire! 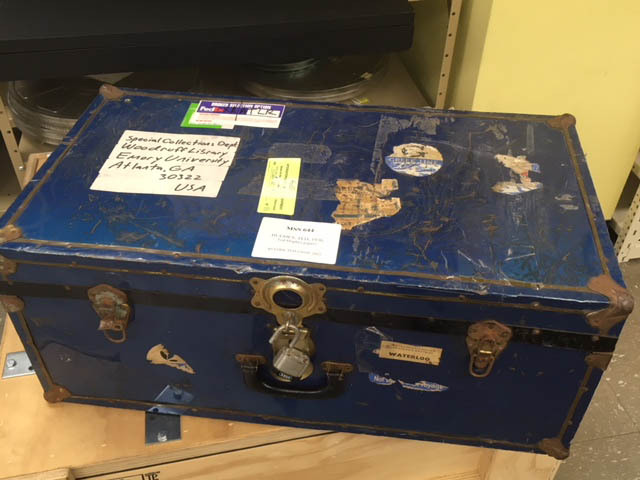 At the Belfast Plath conference in November 2017, I met Julie Goodspeed-Chadwick and we began collaborating on two blog posts about the famous Ted Hughes trunk at Emory. 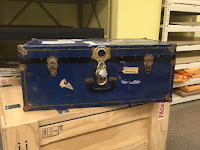 After doing some investigating, drafting and correcting some blog posts, and even getting some photographs of the famed trunk we decided to post about it in February, which is generally a "big" Plath month. The first post revealed that the trunk had been opened more than a decade earlier; and the second post included thoughts on the news from a random selection of Plath and Hughes scholars. Towards the end of February, we (Karen V. Kukil and I) received word that we could use the Ruth Beuscher letters in volume 2 of The Letters of Sylvia Plath. Karen transcribed the letters and then sent them to me for proofing and annotating. It did require some moving around of footnotes but this was a happy thing to do for these letters fill in massive gaps in Plath's (auto)biographical record. And it was an intense, emotional experience. Also in February the full list of items in the auction was released and the counting of pennies commenced. 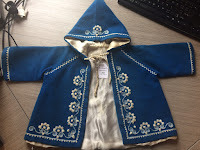 And it continued until the auction itself was held on 21 March 2018. It was appointment viewing and as cliche as that sounds, it really is true. I flirted with staying home from work that day to watch online, but then feared a snow storm, freak loss of power, etc. and decided to come into where the connection is only marginally somewhat more reliable. I do not think I breathed for several hours. It was a stunning event and I walked away the winner of one lot and the loser of many others. A big article was written on the auction by Kate Bolick called "Who Bought Sylvia Plath's Stuff." Around this time, Plath was also given a very overdue obituary in the New York Times. Meanwhile, proofing continued on the Letters into early March and by the end of the month we were indexing. In early April, my winning item, Plath's fishing rod was delivered. I immediately went to New York City to participate in a Letters related talk with Karen. After the event I took a train home and before the next sunrise I was in the emergency room with something wrong with me. Someone obviously did not like my talk and put a hex on me. While recovering from this I continued indexing the majority of the Letters, and then prepared to go to Columbia College in Chicago to talk about the Letters there, and then sat in and participated in a glass taught by my good friend David Trinidad. While in Chicago, I met a fellow-Plath reader Kelly Coyne and had a lovely coffee with her, continued to index and also proof the front matter for the Letters. I felt very happy with the way things went and am now the proud owner of David's worksheets (on pink paper) for his poem "Nothing in the Box" which was his response to the Ted Hughes trunk story. It is a prized possession. In April and May I started trying to trace where various Bonhams auction lots went and even got a guest blog post about Frieda Hughes's blue coat. In addition to Tammy's blue coat (which Plath mentions in a couple of letters! ), David Trinidad won Plath's cane table (see also "Sylvia's Table"), and I acquired two books: White Horses and Black Bulls, signed and inscribed to Plath by the author Alan C. Jenkins and an unbound proof copy of Johnny Panic and the Bible of Dreams with a couple of corrections by Ted Hughes. In the course of time I have traced about 56 lots. Many went to booksellers who have either sold or are trying to sell the individual books from multi-item lots. And I have gotten to see a few things held privately, too. In early May we finalized and finished The Letters of Sylvia Plath, Volume 2: 1956-1963 and at the end of that month I had a surgery I had been putting off. And it actually helped me recover from the fatigue of the project by forcing me to have some down time! But... as I am stubborn I was still at work because by this point Julie Goodspeed-Chadwick and I had started formulating a book project and were soliciting publishers. So while that was going on, I was transcribing some of the letters and journals that will go into our The Selected Writings of Assia Wevill, which the LSU Press will publish. We signed the contract in August. At the end of the month, the Daily Mail of England serialized the letters and the book was published by Faber on 6 September in England. Throughout the year various other blog posts were done such as one looking at the publishing history of Plath's poem "Mad Girl's Love Song"; Ted Hughes' scrapbook at Emory; and a bibliography of movies, plays and the like that Plath saw. Also over the summer, the BBC aired Sylvia Plath: Inside The Bell Jar, a one-hour documentary which featured, for the first time in video, Frieda Hughes and many of Plath's friends talking about Plath and the novel. October brought with it some excitement as is usual for Plath's birth month. There ended up being, I think, two big things. 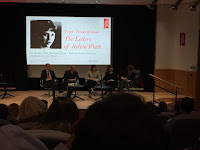 First was the British Library event called "Triple-Threat Woman: The Letters of Sylvia Plath" which included Karen, Heather Clark, Mark Ford, and myself talking about Plath's letters and wonderfully chaired by Elizabeth Lowry. The above photo of the stage and participants was taken by Gillian Groszewski (source: Twitter). The event was a warm one, I feel, and it was wonderful to see familiar faces and meet a lot of new people as well. 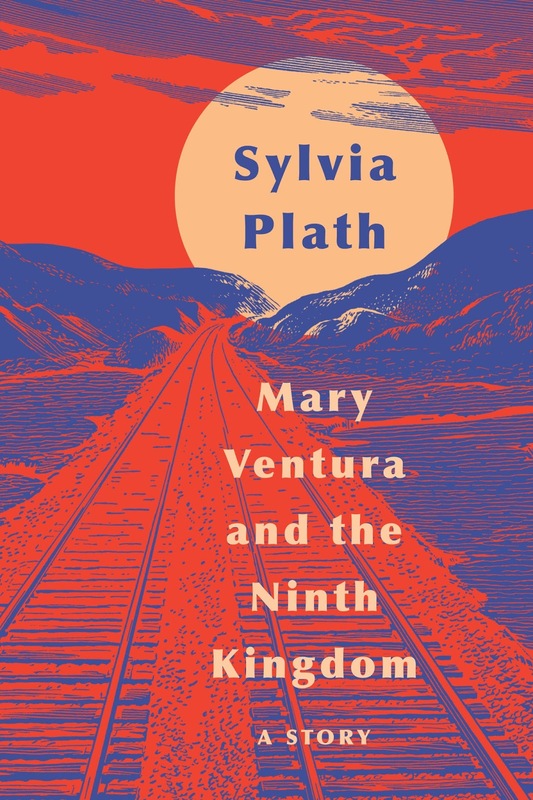 Then for/on Plath's birthday Faber announced they would be publishing a short story by Plath in January 2019 entitled "Mary Ventura and the Ninth Kingdom". I was lucky enough to work with Faber on the press release, as well as with Richard Lea of The Guardian on their article: "Unseen Sylvia Plath short story to be published in January". HarperCollins will publish the story in the US. 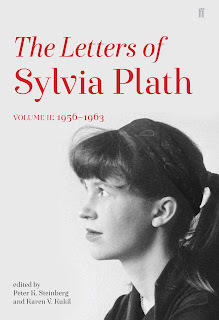 At the eleventh hour, just about HarperCollins had to delay publication of their edition of The Letters of Sylvia Plath by one week from 30 October to 6 November. Within a month, however, the book was already into a second printing which is simply astonishing. The reviews have generally been very good. 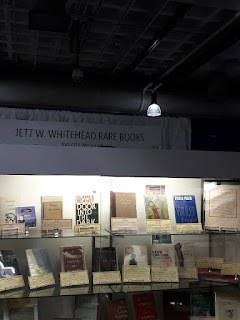 In November I attended the Boston International Antiquarian Book Fair and on the Saturday, sat at Jett Whitehead's booth to talk Plath, sign books, and breathe in the lovely atmosphere of rare books. On Sunday, I gave a talk on the Letters and signed some more books. It was a really neat experience. The highlight for me was the honor of speaking to friends and peers. 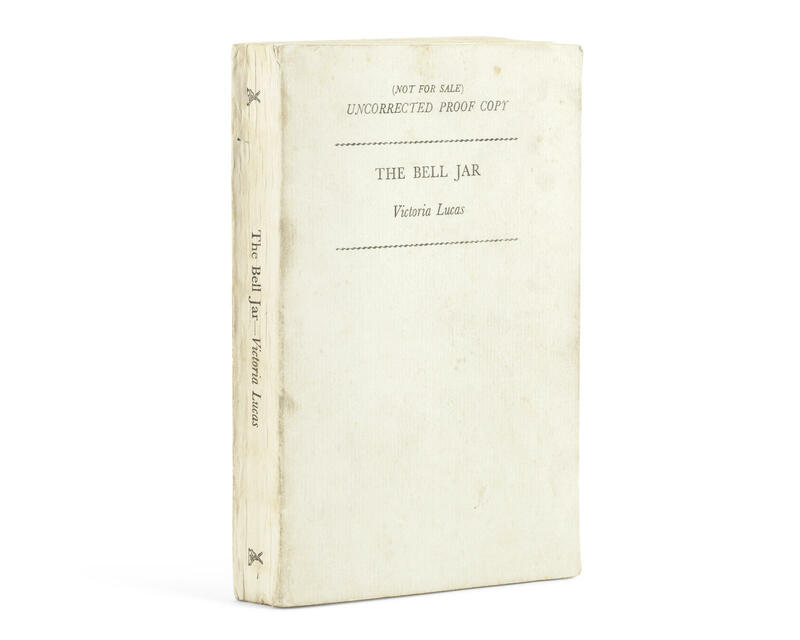 In terms of books, the crowning moment was handling Plath's own proof of The Bell Jar in Jonkers Rare Books booth that was particularly magical. My twitter friends voted for immediate access to two long-term projects that have been ongoing for years, so I skipped a few scheduled blog posts to get you good people access to the Sylvia Plath Archival Documents Hub and a bibliography of Articles about Sylvia Plath. Enjoy! 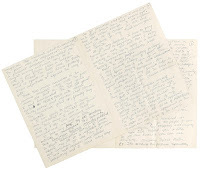 On 5 December, a letter from Sylvia Plath to Katherine Benion sold at Bonhams for $8,000. It was a six-page handwritten letter and is a lovely one. Congratulations to the winner. Also in December, Plath's adolescent home located at 26 Elmwood Road went on the market. The current owner purchased the house directly from Aurelia Plath in the 1980s. That's just two owners from October 1942 until the end of 2018/early 2019. Impressive. I have been privileged to be inside the house twice in 2012 and 2016. 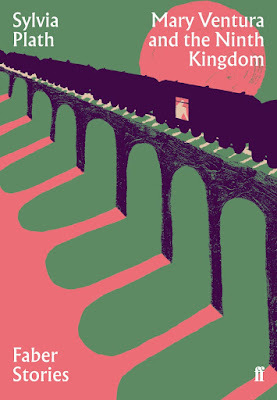 In addition to Mary Ventura and Ninth Kingdom coming out (Faber & HarperCollins), there are reissues to look forward to in 2019 including the Carol Ann Duffy version of Selected Poems (Faber, March) and Ariel (Faber, September). 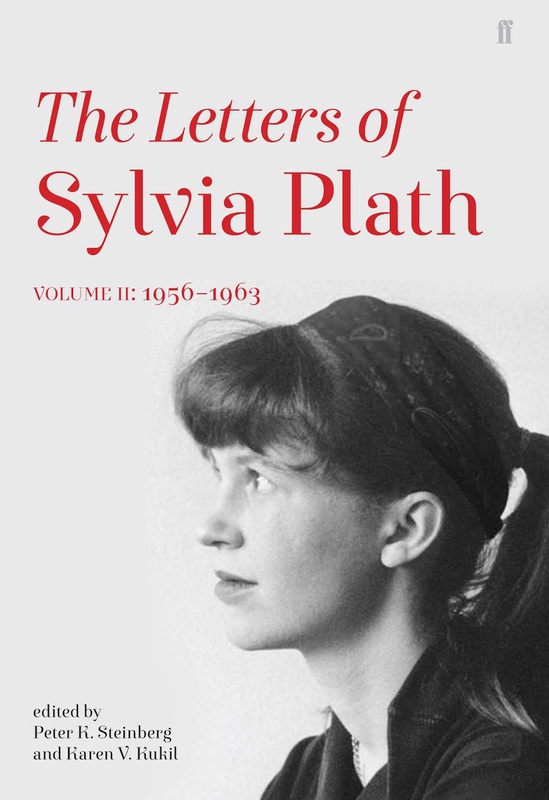 Also, probably in the autumn, will be The Letters of Sylvia Plath in paperback. More information on those when I have it! We have some books on Sylvia Plath to look forward to in the coming years. First up in 2019 should be Sylvia Plath in Context, a collection of essays edited by Tracy Brain to be published by Cambridge University Press. Also on the horizon are Carl Rollyson's The Last Days of Sylvia Plath and Heather Clark's The Light of the Mind: A Life of Sylvia Plath. Both promise to reveal new details and insights into Plath's biography and I am sure you are just as impatient as I am to see these in bookstores. Well, this is just about all I can think to point out about this year in Sylvia Plath from my perspective. How about yours? What are your impressions for this year of Sylvia Plath? I'm sorry if I forgot something or overlooked something; it was purely accidental. A year is a long time and they can be tricky to summarize. Remember that the blog archive of more than 1,150 posts is there; I hope some of the older posts are still relevant! And please do not forget about my website for Sylvia Plath, A celebration, this is. Unless I get something Plath-related for Christmas, this will be the last Sylvia Plath Info Blog Post of the year. I have an exciting post all set and ready for 1 January 2019 and am looking forward to some down time with family. Thank you all, as usual and with all the genuine sincerity I can express, for reading these blog posts, for your comments and support, for your emails and your friendship. I would like to ask that for any content which you may have enjoyed or benefited from, please consider sending me a tip via PayPal. There are expenses associated with the work I do on Plath and while it is something I enjoy, it is starting to take a toll. Thank you for at least considering! All funds will be put towards making Sylvia Plath Info better. This has been the most vigorous period of my Plath-life and I know I would not have gotten through it without your support and words of encouragement. So, thank you sincerely for that. The year ends much as it began as we are finalizing a list of corrections and updates for the paperback issue(s) of The Letters of Sylvia Plath. Be safe, be merry, be Plathy! All links accessed on 8, 16, and 24 November and 1 and 12 December 2018. Archives (letters received; some texts and proofs): of literary magazine. Submissions of material to Critical Quarterly; friendly personal news; literary gossip; academic life. Some polite notes from famous names. Some material concerning Cox or Dyson rather than the Critical Quarterly. As you might imagine, they contain Sylvia Plath archival materials... There are ten letters from Plath to the journal's editors A. E. Dyson and C. B. Cox from 1960 to 1961. 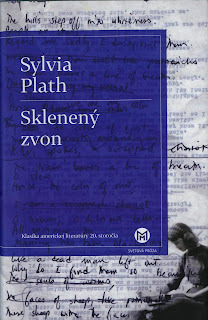 I learned of the collection first through Linda Wagner-Martin's wonderful Sylvia Plath: A Literary Life (1999, 2nd ed. 2003). I have withheld posting on this Sylvia Plath collection for many years as the ten letters formed an integral part of an essay I selfishly wanted to write on the poetry supplement Plath edited for the CQ in 1961 entitled American Poetry Now. 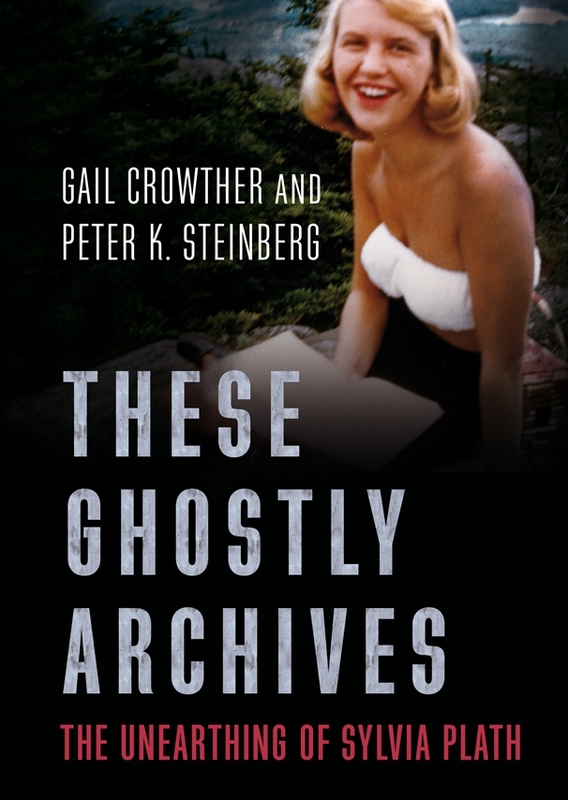 I was able to write the essay, "'What's been happening in a lot of American poetry': Sylvia Plath as editor and reviewer", for the book I co-wrote with Gail Crowther, These Ghostly Archives: The Unearthing of Sylvia Plath (Fonthill), where it appears as Chapter 7. Another reason for not posting this was that the letters were to be printed in The Letters of Sylvia Plath, Volume 2. 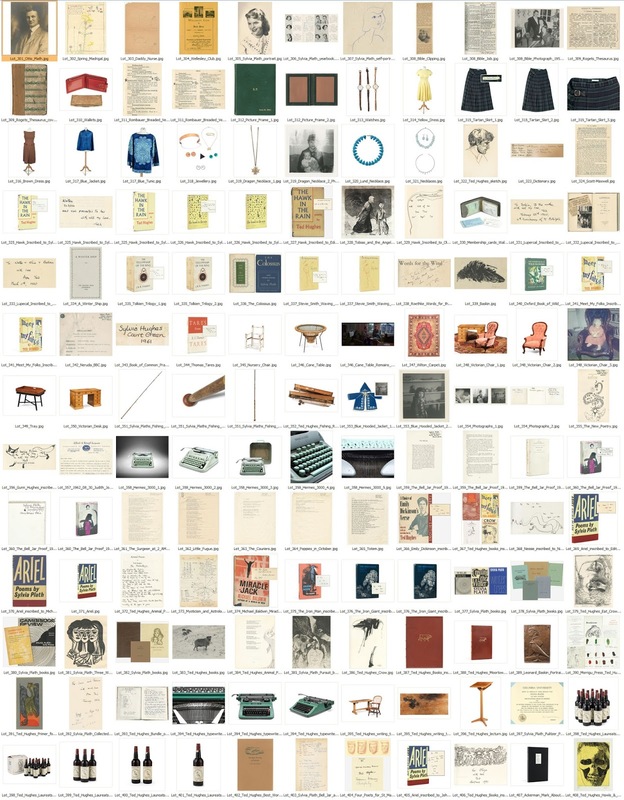 This is one of those intricate archival stories where pieces are scattered and where sense can only be made once all those pieces are discovered, assembled, and studied. 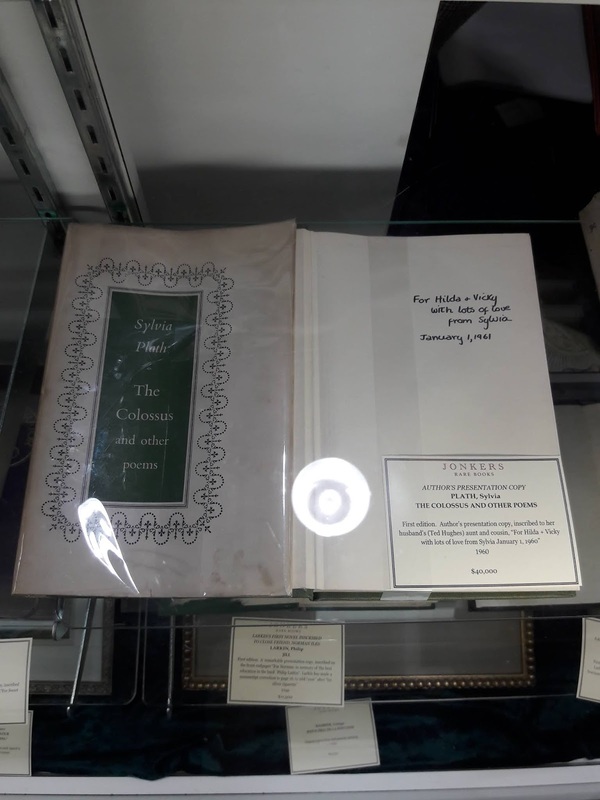 Papers relating to Plath's work on the American Poetry Now pamphlet are spread between at least five repositories: University of Kansas, Indiana University, Smith College, Emory University, and the University of Manchester. It is possible other materials are held elsewhere, too! The correspondence at the University of Kansas is just part of the story. The letters are dated 16 January 1960; 22 February 1960; 1 January 1960 ; 3 May 1961; 17 June 1961; 25 June 1961; 24 August 1961; 17 October 1961; 14 November 1961; and 12 December 1961. While it is evident that Plath received letters, it does not appear that she kept them (and the journal did not apparently retain carbons). The initial letters from 1960 deal with publication of Plath's poetry. Namely her verse "Medallion" which was awarded a best poem prize as well as submissions. The eight 1961 letters all relate to American Poetry Now. All links accessed 20 April 2017 and 6 December 2018. 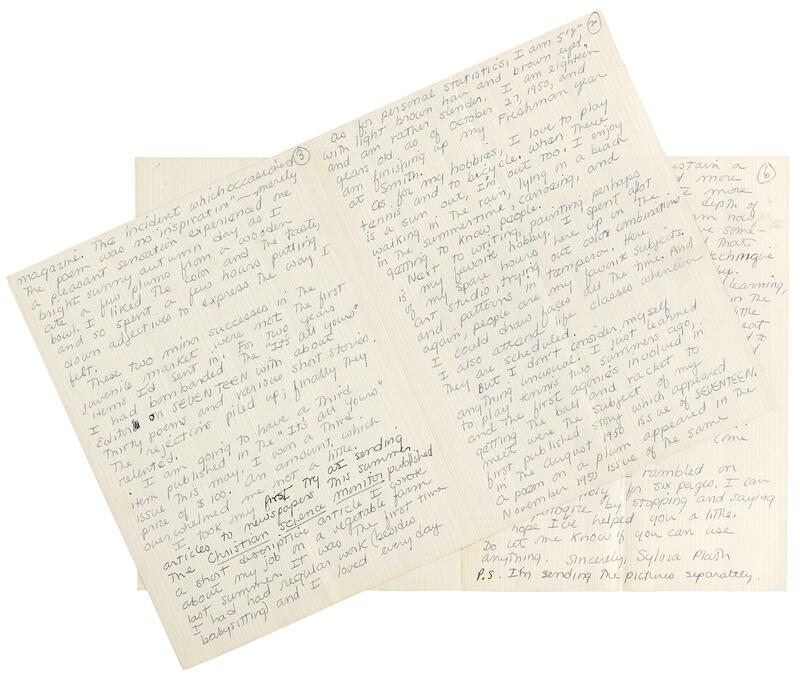 A six-page handwritten letter that Sylvia Plath wrote to Katherine Benion on 3 March 1951 appeared at auction today at Bonhams, New York. Lot number 212 was estimated to sell for $7,000-$10,000 dollars, which averages to a minimum of $1,166.6666666667 per page! The lot sold for $10,000 which includes the buyers premium. Hammer price was $8,000. Autograph Letter Signed ("Sylvia Plath"), to Miss Katherine Benion, concerning how she got started in writing, 6 pp (on 2 pairs of conjoining leaves), 8vo, [Northampton, MA], March 3, 1951, in ink on blue-bordered patterned stationery, folded, light handling smudges. Provenance: Family of the recipient, by descent. A remarkable early Plath letter discussing her budding career as a writer, written when she was just 18 years old and attending Smith College. "... that's the total of my 'published' record — two poems, a story, an article and a story to appear in May." The recipient was a teacher and freelance writer, who was a young mother at the time. Responding to an inquiry about her writing, Plath seems unsure about whether it is her true calling: "I read one choice little article about me titled 'Born to Write.' That, I think, was rather too bad, because I just happened to get a few little things published, and I was born for reasons other than writing, I'm sure." She seems a little surprised to have anyone ask about her, saying "... I don't consider myself anything unusual...." and "When I am asked to talk about myself, I always stop with a start and wonder — Who am I anyway? I am afraid sometimes that I am writing about a fictional character that exists only in my mind." On the last page she talks about her development as a writer, saying "As I grew older, I found that I could sustain a story mood for more and more pages. I could assimilate more experiences with a greater depth of feeling, and so here I am, now eighteen, hoping that I have something worthwhile to say...."
Sylvia Plath received a letter from Benion on 17 February 1951. 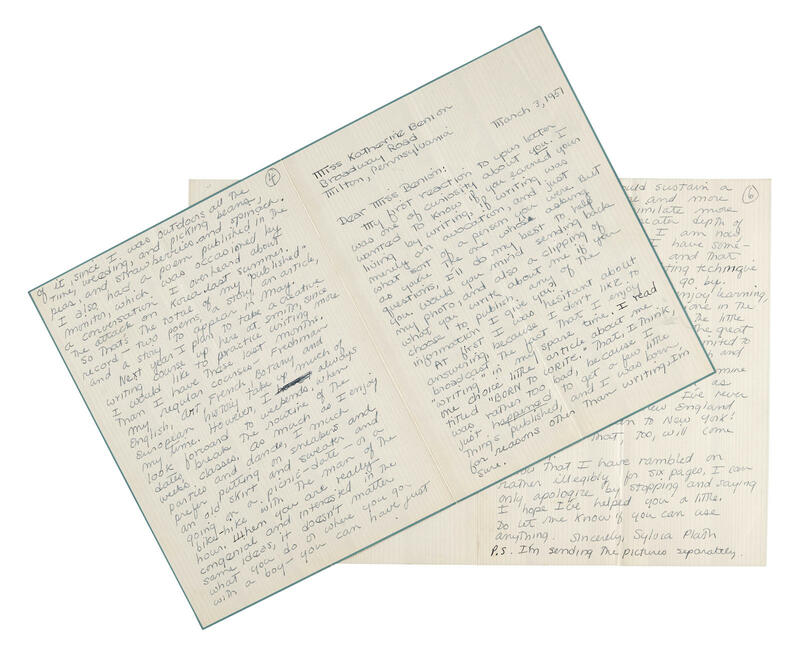 Plath replied in this 3 March letter and received a second letter from Benion on 24 March 1951. 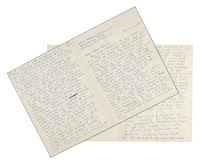 Both letters from Benion are stored in Plath's High School Scrapbook held by the Lilly Library. 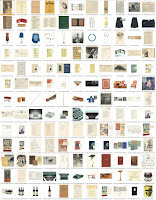 (See a catalog of the scrapbooks contents.) Benion sought information about Plath for a proposed article on a young writer but it is not clear whether said article was ever written or printed. All links accessed 26 November and 5 December 2018. One cannot deny that reading Sylvia Plath's works fills each of us with immense pleasure. It is also a thought-provoking activity which often leads to writing about Plath. Many of us have done it and will continue to do it. Articles about Plath show how she was viewed at the time of their publication as well as reflect the education and (potential) biases of the writer. They are a rich history of perspectives and form the foundation upon which our current interpretation(s) and understanding(s) of Plath's works and life are built. And they potentially forecast how Plath scholarship will develop in the future, too. Or, at least, in some instances, show us how far we have come. I have been at work for about fifteen years or so on an updated bibliography of articles about Sylvia Plath that is built from Stephen Tabor's Sylvia Plath: An Analytical Bibliography (1987). Additional bibliographies by Meyering (1990), Lane and Stevens (1978), and Northouse and Walsh (1974) are other books the assembled lists of articles. I have limited my scope largely to articles in English as that is the only language I can read, and it is also the predominant language in which Plath is discussed. I am particularly excited to publish this list now as 2018 is the 20th anniversary of my website for Sylvia Plath, A celebration, this is. The Articles about Sylvia Plath link is now active on the bibliography page of my website. It joins other lists of articles such as reviews of Plath's books and articles on her first suicide attempt. Before I converted the document to HTML, the list of articles stretched to more than 160 pages. The document is imperfect in many ways. For example, there are citations lacking some information. Dates and titles may even be "incorrect". The internet has in some ways wreaked havoc on the art of bibliography because not only do articles appear online both before, concurrently to, and after they are printed, but oftentimes the title in one format is different from the other. So what can you do? The best you can! I prefer the information refer to printed sources, but in some instances it was impossible for me to ascertain the preferred details. I have not numbered the entries either. This may disappoint some, but it is far easier not to do this. My apologies. For online articles, there are no url's/links and this is because at the beginning of this project url's were finicky, often broken, and sometimes just simply gone a short time later. The document will be updated periodically throughout the year. If I have omitted an article, please do not take it personally! But, please do email me the citation in the format that matches those on the page. All links accessed 16 and 26 November and 1 December 2018. 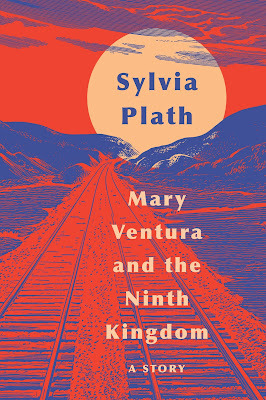 A recent listing on HarperCollins website (and Amazon.com) confirms that they will publish Sylvia Plath's short story Mary Ventura and the Ninth Kingdom, first written in December 1952 and revised in January 1953, under the Harper Perennial imprint. HarperCollins is offering a paperback (ISBN: 978-0062940834) on sale on 15 January) and hardback (ISBN: 978-0062940858) on 5 February. 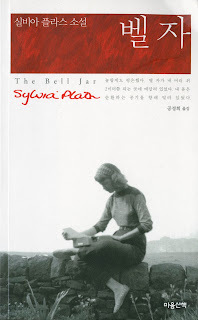 Visit HarperCollins' Sylvia Plath page for books and deals. 3) Hardback for $15.99 on 5 February (Amazon). Faber, in England, will publish a paperback edition for £3.50 on 3 January 2019 (ISBN: 978-0571351732). News of the story's publication was first made in The Guardian. It is the first new Plath fictional prose (that is not a work for children) to be published commercially since Johnny Panic and the Bible of Dreams was released in 1977. For those as mathematically challenged as I am that's 2019-1977=42 years. This is major. All links accessed 25 November 2018. Sylvia Plath archives are rather dispersed and so it can make locating documents tricky. So, in an effort to aid in locating typescripts and manuscripts of Plath's creative works, I have collated a spreadsheet called the Sylvia Plath Archival Documents Hub. There are four worksheets: Poetry, Prose, Correspondence, and Photographs. In the first two, Poetry and Prose, I am tracking only the manuscripts and typescripts. The largest worksheet consists of correspondence. This was developed as part of my tracking spreadsheet of Plath's letters for The Letters of Sylvia Plath project but I've included letters she received that survive, as well as letters that may relate to her in some fashion. There is a clear division at 11 February 1963 to indicate to you this is after Plath's life. It is not by any means complete in the latter category (post-11 February 1963). Now that Letters project is over, I felt the information was worth sharing. The fourth worksheet compiles all the known photographs of Plath held in archives and published in books. I have done what I think is my best to describe the photograph in hopes of helping you picture each respective one. The spreadsheet is a Google document and will be View only access. The creative works are sorted alphabetically by title. I can do nothing about how slow it loads, so please be patient with this cloud-shared document. If you notice errors or omissions, please do let me know. Over on my website, A celebration, this is, is a list of all the known, public-accessible Plath archives. In addition to this blog post and that Archival Materials page, the document will be linked on the Bibliography page, and of course it can be bookmarked. I truly hope you are able to make use of it. All links accessed 16 and 24 November 2018. Novelist and biographer Andrew Wilson reports, in the 24-30 November 2018 Radio Times, that The Letters of Sylvia Plath, Volume 2: 1956-1963 has been selected, like it's predecessor Volume 1, as Radio 4's Book of the Week. The letters, which many of you have now read, will be serialized on Radio 4 twice a day next week from Monday to Friday at 9:45 am and 12:30 pm. This is a thrill and honor, and is wonderful exposure both for Plath and for the book. All links accessed: 20 November 2018. What a weekend in Boston! 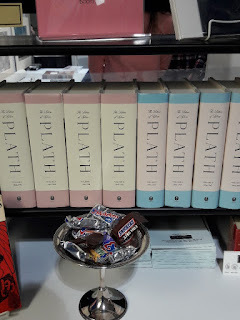 It was the annual Boston International Antiquarian Book Fiar and as usual I browsed through booksellers stock looking specifically for Sylvia Plath books. But this fair had particular targets in view... I was particularly keen to see some of the volumes for sale that were part of the big Sylvia Plath/Ted Hughes auction at Bonhams of the property of Frieda Hughes. As such, I spent some time at a few booths. Apologies in advance for all the super dodgy cell phone photographs. But before I get to those, the primary reason for my attendance this year was to promote, sell, and sign (if wanted) some copies of both volumes of The Letters of Sylvia Plath. I was in Jett Whitehead's book for a good few hours promoting this book, talking to Jett and to many customers that stopped by. To my happiness some books sold and even some of the book dealers were buying copies. Sometimes it is hard to really consider just how many people are interested in these books. I just feel so genuinely happy to see copies walking away. I was really happy, too, to meet Rebecca Rego Barry, the editor of the excellent magazine Fine Books & Collections. It is always lovely to meet the real person behind the emails. 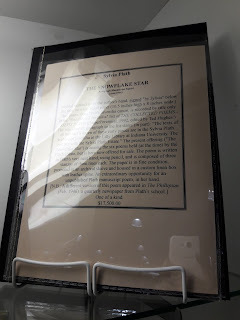 Jett is the current owner of a unique manuscript version of Sylvia Plath's poem "The Snowflake Star" and so to be near it for so many hours was a righteous privilege. After my time in Jett's booth on Saturday I went to Peter Harrington's booth and also Jonker's, to see their wonderful items. 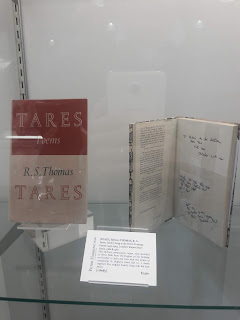 In Peter Harrington's, I got to see the copies of RS Thomas that Hughes gave to Plath for her birthday in October 1961, her first in Devon. Some of books were copies that Hughes signed and inscribed to his sister, Olwyn, too. And these were also excellent and interesting to see as the inscriptions were in some ways more original and personal than those he signed to his wife. According to the books' catalog/sale slip, the copy of Tares includes to scraps of Ted Hughes handwriting. It appears to be for some prose, possibly a draft of a review or a broadcast? 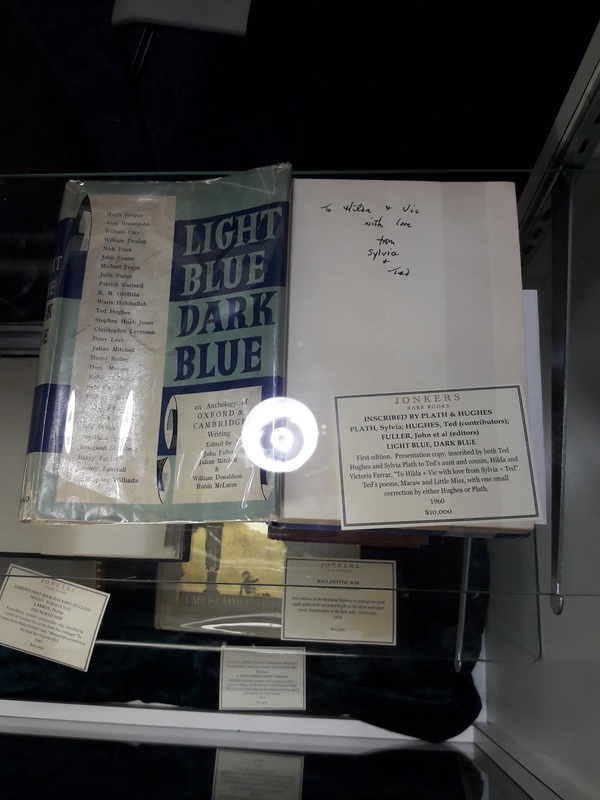 Jonker's was a particular delight because in addition to purchasing Plath's proof copy of The Bell Jar and displaying it at the Book Fair, they had some exceedingly recent acquisitions on show, too. So I was fairly taken aback whilst talking to Tom about these new books. The first is a signed and inscribed copy of The Colossus (Heinemann, 1960) to Hilda and Vicky Farrar. Dated 1 January 1961, it is an additional copy of the book that we now know about (and, yes, I've already amended the footnote about known signed copies of The Colossus on pages 530-1 in The Letters of Sylvia Plath, Volume 2, so look for this update in the paperback!). Plath's Colossus was reviewed on the BBC on 18 December 1960 when Plath and Hughes were in Yorkshire. It is possible the whole extended family heard the broadcast. And it could be that Hilda and Vicky requested a copy. Plath and Hughes returned to London from Yorkshire on 31 December 1960, so it seems the first thing she did in London on New Year's Day 1961 was sign this book. Currently priced fairly at $40,000, I am quite grateful to whomever purchases it for me. And then there is the following, which found me suddenly cotton-mouthed, weak-kneed, and with a fuzzy, stumbling brain. 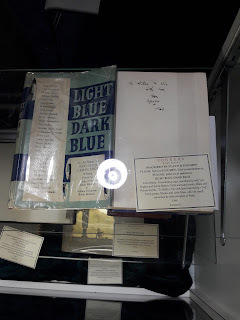 A copy of the anthology Light Blue, Dark Blue, inscribed to Hilda and Vicky and signed by BOTH SYLVIA PLATH AND TED HUGHES. At just $10,000, this is priced to sell and would be considered, by me, to be an absolute steal. In addition to the above, from Vicky Farrar Watling, Jonkers has lovely copies of Ariel (1965), Three Women (1968), and some Ted Hughes books. Amazing. Lucius Books of York was on hand and they have some rather extraordinary books including a Victoria Lucas edition of The Bell Jar which I saw in their case. They also have the copy of the Knopf edition of The Colossus that Plath signed to Winifred and Garnett Davies, too. In general, it's an excellent time to be a reader and fan and collector of Sylvia Plath. The variety of books available, if one has the means (I do not, which is mean), makes for exciting times. Sunday was the Big Day! I got to the fair early and was permitted the opportunity by Jonkers to go through the proof of The Bell Jar page by page comparing my paper from a few years ago on the "Textual Variations in The Bell Jar Publications". This was awesome because it proved my earlier paper crap. I joke, I got a lot of them right, but learned that I missed a few for which I am grateful. But what I was really surprised by was learning that some corrections from the proof to the first edition were the publishers, Heinemann, and not, evidently, by Plath. I am exceedingly grateful and like an idiot did not take pictures of the book. But it is, however, indelibly stained in my mind. At any rate, I need to revise that paper but do not plan to re-publish it until after Jonkers' copy sells. So, someone buy it! 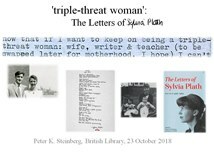 But time was ticking on to my talk at 3 on "Sylvia Plath's Letters & Traces" which is the same title as previous talks but did contain very different content. I do not like to give the same talk twice and generally find revision keeps it fresh. It was a nice group of people who came to the talk, and there was a good batch of questions afterwards. I really cherish the opportunity to talk Plath and talk about the process of editing the Letters and other Plathian things. And even more, I covet meeting like-minded, passionate people such as L, E, and H; and even ran into an old co-worker from my previous life which was really cool. It was all quite special. 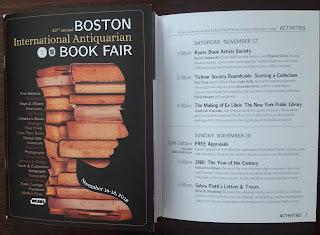 This was my favorite Boston International Antiquarian Book Fair yet and I did not even walk away with a book (or books) wrapped in brown paper bag with an orange SOLD sticker on it. All links accessed 17 November 2018. The immediacy of Twitter has often inadvertently led to the absence of some information on Sylvia Plath appearing on this blog. For example, the reviews of the Letters of Sylvia Plath, Volume 2 have been tweeted and recorded on my bibliography of reviews of Plath's work on my website, but not here. So I thought I might do a little blog post to post the reviews and include links to however many that I can which appear online. Linking to reviews is presently a feature on my website that I do not take the time to do. Perhaps I should? Probably not, I still fear the breaking of links as it what so often happened earlier in this century. Here are the reviews, including some pieces which are more coverage of the book, of Letters of Sylvia Plath, Volume 2 that have been published to date (or will be shortly--Rollyson and Schoerke). Some are behind paywalls and one just is not online. Some were printed in the newspaper on a date different to when it appeared online and often with a different title...which makes bibliography in the 21st-century really difficult. For some, like the Financial Times, I have not see the printed version so page numbers are missing. Lastly, some reviews, like Paul Alexander's, appeared in several subsequent newspapers but I have only listed the first appearance. Adams, Alexander. "The poetry and the pain." Spiked. November 13, 2018. Alexander, Paul, "Plath's Joy and Desolation." The Washington Post. November 4, 2018: E10. Bate, Jonathan. "I now see the man I loved is dead." The Times. September 8, 2018: 13. Bayley, Sally. "Plath's Passions." Literary Review. October 2018: 22-23. Biggs, Joanna. "I'm an intelligence." London Review of Books. December 20, 2018: 9-15. Carey, John. "Dispatches from a heart in agony." Sunday Times. September 9, 2018: 36. Chiasson, Dan. "'The Girl That Things Happen To'." The New Yorker. November 5, 2018: 62-7. Clark, Alex. "Who was the real Sylvia Plath?" Financial Times. October 5, 2018. Cooke, Rachael. 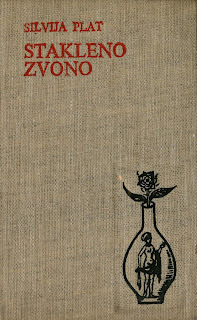 "Sylvia's Plath and other torments." The Observer. September 9, 2018: 44-5. Ferri, Jessica. "Revealed: Sylvia Plath's Last Desperate Letters." The Daily Beast. November 9, 2018. 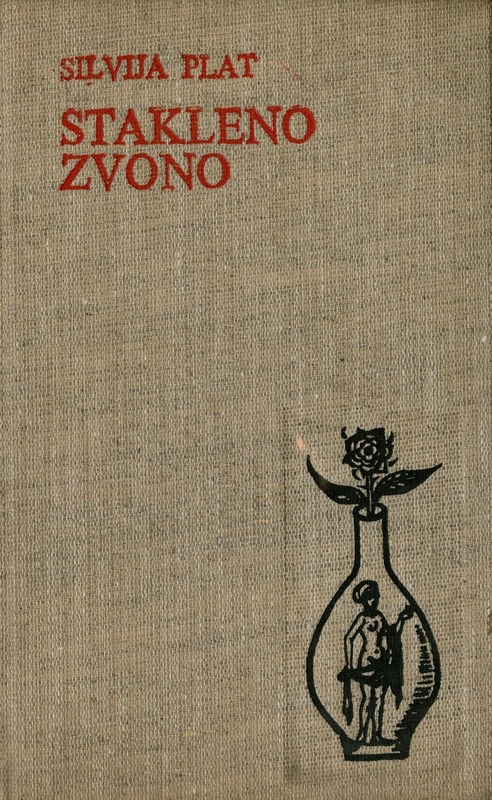 Haas, Lidija. "New Books." Harper's. October 2018: 83-6. Lowry, Elizabeth. "Marriage as religion...Plath's correspondence captures life with Ted Hughes in all its joys and agonies." The Guardian. September 19, 2018: 16-17. Lowry, Elizabet. "Books of the Year 2018." TLS. November 20, 2018. Marriott, James. "Books of the Year 2018." The Times. November 23, 2018. Meyers, Jeffrey. "Plath has the last wounding word." Standpoint. November 2018: 50-2. Parker, James. "The Haunting Last Letters of Sylvia Plath." The Atlantic. January/February 2019. Pierre, Summer. "Sylvia Plath's Last Plan." The New Yorker. Raine, Craig. "'Ted is liar. Ted beats me up. Ted wishes me dead': Sylvia Plath descends into madness and misery." The Spectator. September 15, 2018: 31-2. Renolds, Gillian. "Radio Review." The Sunday Times. December 2, 2018. Roiphe, Katie, "Mad Girl's Love Song." The New York Times Book Review. November 10, 2018: 39. Rollyson, Carl. "Sylvia out in the cold." The New Criterion. December 2018: 78-82. Schoerke, Meg. "'I know the bottom, she says': Sylvia Plath's Correspondence 2." The Hudson Review. Autumn 2018: 629-39. Seaman, Donna. "The Letters of Sylvia Plath." Booklist. October 1, 2018. Sehgal, Parul. "A Marriage Falters and Masks Fall Away." The New York Times. October 24, 2018: C4. Solly, Meilan. "Sylvia Plath's Last Letters Paint Visceral Portrait of Her Marriage, Final Years." Smithsonian.com. October 31, 2018. Sullivan, Hannah. 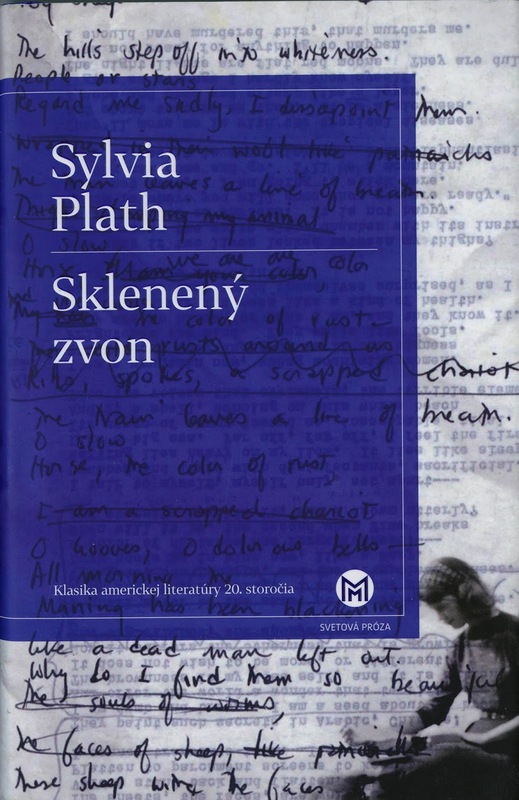 "Revealing Sylvia Plath." TLS. November 2, 2018: 3-4. "The Letters of Sylvia Plath." [Starred Review] Kirkus Reviews. August 1, 2018. "The Letters of Sylvia Plath." [Starred Review] Publishers Weekly. August 6, 2018. Thomson, Ian. "The suffering poet who sighed for lost Edens." Catholic Herald. November 22, 2018. Wagner, Erica. "In sorrow and in anger." New Statesman. September 19, 2017: 67. Weatherby, Lonnie. "The Letters of Sylvia Plath." Library Journal. October 1, 2018: 59. 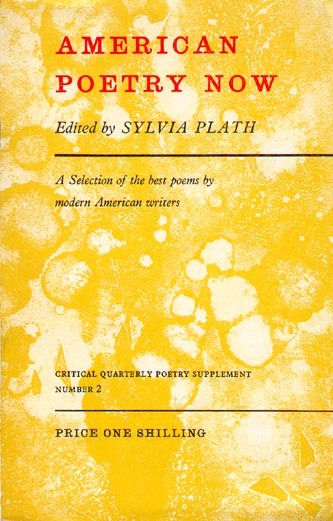 "A well-worn Plath." Private Eye. September 21-October 4, 2018: 34. Wilson, Andrew. "The darkness that claimed Sylvia Plath." Evening Standard. September 20, 2018: 40. Wilson, Andrew. "Chaos & Creativity." Radio Times. November 24-30, 2018: 146-47. Wood, Gaby. "'Now, I shall grow out of his shadow...' — Sylvia Plath's last letter." The Telegraph. September 15, 2018: 8-9. Yandava, Ramya. "The Last Letters of Sylvia Plath." Cornell Daily Sun. November 13, 2018. All links accessed 15 and 16 November and 12 December 2018. This next weekend, 16-18 November, the Hynes Convention Center on Boylston Street, Boston, will host the 42nd annual Boston International Antiquarian Book Fair. This one will be a capital-D Delight. 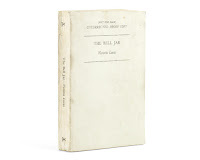 I say this because Jonkers Rare Books of Henley on Thames, England, will be showing off the most expensive Sylvia Plath proof book ever: her own proof copy of The Bell Jar at their booth, 525. As we learned recently in the publication of The Letters of Sylvia Plath, Volume 2, Plath received the proof shortly after she found out about Ted Hughes' affair with Assia Wevill. So her edits to the book date from after circa 10-11 July 1962. Incredible to think she was reviewing this at the same time as dealing with the marital issues as well as playing host to her mother, visiting Court Green, Devon, from Massachusetts. Anyway, I am truly excited to see this book and hope to review it carefully. Several years back I did a study of the "Textual Variations in The Bell Jar Publications" and I would like to see how it compares; I am certain though I tried to be careful that I missed some. 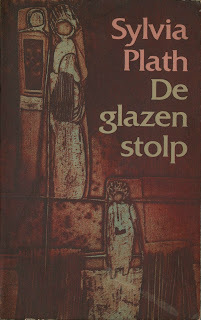 In addition to that, I am sure other fine, rare books by Plath will be on hand. The Book Fair is amazing because it is like a petting zoo: you can touch just about anything you want. 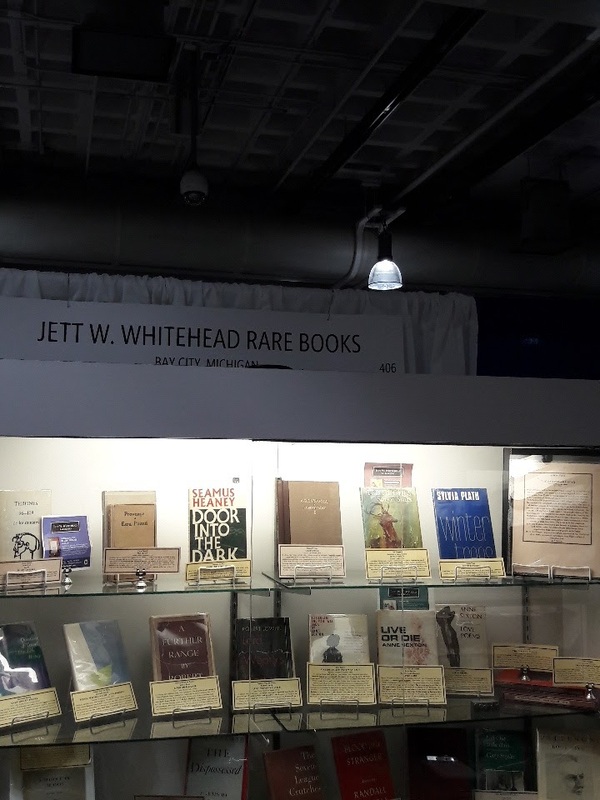 On Saturday, 17 November, I will be in Jett W. Whitehead Rare Books' booth from 1-3 p.m. with copies of both volumes of Plath's letters for sale. I would be honored to sign them, and discuss any aspect of the books and the project. Jett will be at Booth 406. 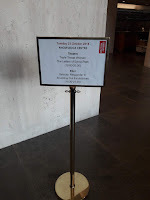 On Sunday, 18 November, I will again be at Jett's book from about 2 or so for an hour. Then at 3, in the Exhibit Hall Theater, I will be giving a talk entitled "Sylvia Plath's Letters & Traces". I am really thrilled to be giving this talk. It should take around 30 minutes and then there will be time for discussion. Admission to the Fair on Saturday and Sunday is FREE! So, there is almost no excuse not to come, fondle some books, and talk Plath. All links accessed 1 November 2018. 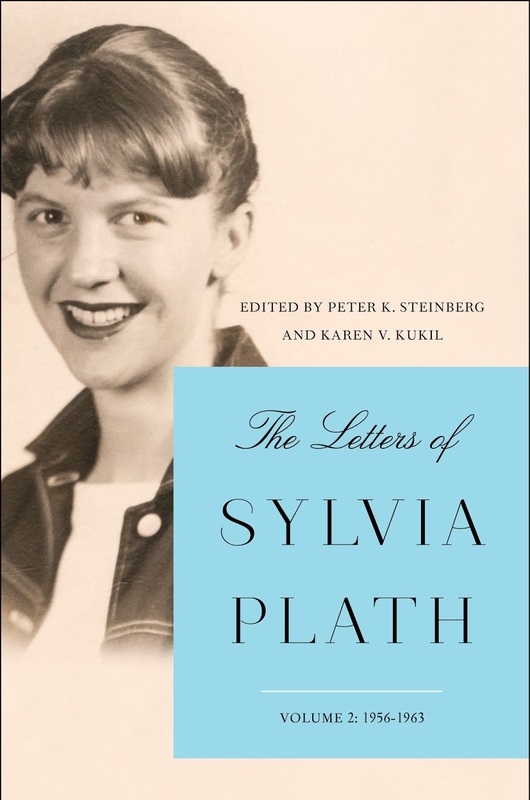 Today, HarperCollins publishes The Letters of Sylvia Plath, Volume 2: 1956-1963 in the United States in both hardback book and Kindle edition. The book is available, as you might imagine, from Amazon as well as from the more traditional of bookstores (remember those?). Please visit the Faber edition publication blog post for some details you may find interesting. Perhaps the best aspect of having the book published on very separated dates is the fact that two celebrations are called for! If you need me, please look inside of a pint glass. Alexander, Paul, "Sylvia Plath narrates her own decline." The Washington Post. November 4, 2018. Chiasson, Dan. "'The Girl That Things Happen To'." The New Yorker. November 5, 2018. Solly, Meilan. "Sylvia Plath’s Last Letters Paint Visceral Portrait of Her Marriage, Final Years." Smithsonian.com. October 31, 2018. There are more to come in the New York Times Book Review, Hudson Review, The Atlantic, Harvard Review, New Criterion, and others. A full bibliography of reviews is on my Reviews of Works by Sylvia Plath page on A celebration, this is. Thank you all for your interest in these two volumes and for your patience and your support as we prepared them. All links accessed 10 October and 1 November 2018. Upon my last flight home from England I wrote a long blog post so felt like it was an appropriate us of time, when not partaking of quantities of free alcohol to neutralize the turbulence of flying against the wind, to do so again. From 21-28 October I was in England, as you might know. The purpose of the visit was a talk at the British Library on the 23rd October with The Letters or Sylvia Plath co-editor Karen V. Kukil, as well as scholar and biographer Heather Clark and poet Mark Ford. I am a terrible judge of my own performance, but I hope the event was conducted and performed, by each of us, successfully. It was terrific to see familiar faces and friends, and, as well, to meet so many new people. I did not get to meet as many people as I had hoped. I have recently learned that the event was recorded! And once it is made available online I will add a link here, as well as sent out a notice on Twitter. An informal pub meet-up at the Lamb on Lamb's Conduit Street, near Rugby Street and the Church of St. George-the-Martyr where Plath and Hughes were married, before the British Library was a lot of fun. Thank you to Peter F, Lydia W, Emily Van Duyne, Elizabeth Lowry, Sarah Fletcher, Sam, Di Beddow, Heather Clark, Suzanne D, Diane D, and Gail Crowther for coming! I had meant to take photos but just did not get the chance. The same day as the event, Faber published a blog post I wrote on their website about the Letters. It was a follow-up piece to the one they published after Volume I came out. It was really nice to be able to sort of conclude the project this way. I hope that you enjoy it. As part of this visit, of course, I dragged my wife, I mean, we visited a number of Sylvia Plath related sites in London. So this blog post is primarily to show some of the photographs I took in London. After the event, my wife and I invaded Gail Crowther's home for a few nights and we enjoyed some rest, beautiful drives, clear air, hikes, terrifically narrow and windy roads, and scenery as well as fantastic food and conversation. On the first day we conveniently found ourselves in Primrose Hill to photograph 3 Chalcot Square and 23 Fitzroy Road. I took two 360 Theta photographs, too: 3 Chalcot Square | 3 Chalcot Square | 23 Fitzroy Road | Primrose Hill. As luck would have it, we were lodging just down the road from the BBC where Plath regularly visited the Broadcasting House on Portland Place. Plath never visited the Lakes District, and neither had I before this visit to England. The following is from a hike about halfway up Black Combe where visible were Blackpool, Wales, Yorkshire, the Isle of Man, and even Scotland. On a really clear day you can see Ireland, but we were not so lucky. We wandered all over and found ourselves strolling through Trafalgar Square one last night and then I remembered Plath's journals... printed in Appendix 11 is a drawing of one of the fountains, she writes of having her back to the National Gallery and looking at the back of Nelson's Column and across the square to the "red & white checked flag flapping in blue sky over Canadian Pacific clock". Mary Ventura and the Ninth Kingdom! 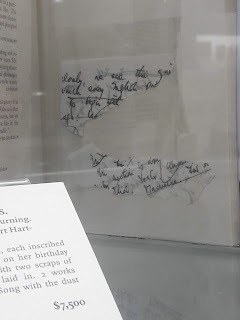 Backtracking a bit... On the day of the Plath event I visited Faber for the first time which was awesome. 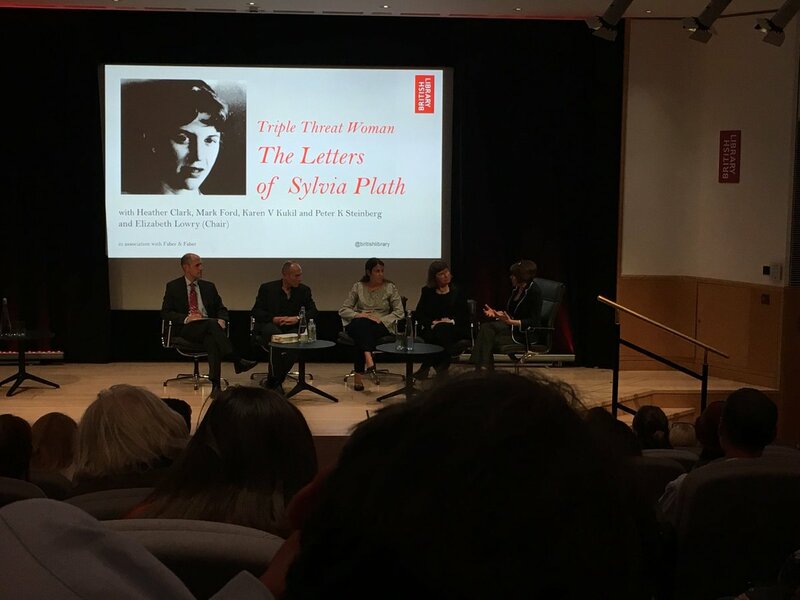 It was so exciting to visit the offices of the publishers of the Letters of Sylvia Plath and to meet some of the people before and at the event. It was really special, to put faces and voices with names. During that visit, coincidentally, I had an email from another member of Faber's staff asking to review the final text of a press release that had been in progress for weeks about the forthcoming publication of a short story by Sylvia Plath entitled Mary Ventura and the Ninth Kingdom (Amazon). It was an exciting yet stressful few days polishing off the text, revising commentary, and then answering a slew of queries from Richard Lea of The Guardian for their article announcing the publication which was published in their print edition on Plath's birthday. The announcement seems to have been greeted on social media with a lot of enthusiasm which is terrific. All links accessed 29-30 October 2018.